I was lucky enough to go with my family to see an advanced screening of The Peanuts Movie that comes out today!! I loved it, as did my sons and husband. My (almost) three year old really enjoyed all of Snoopy's antics and I enjoyed seeing the all the classic characters on the big screen. 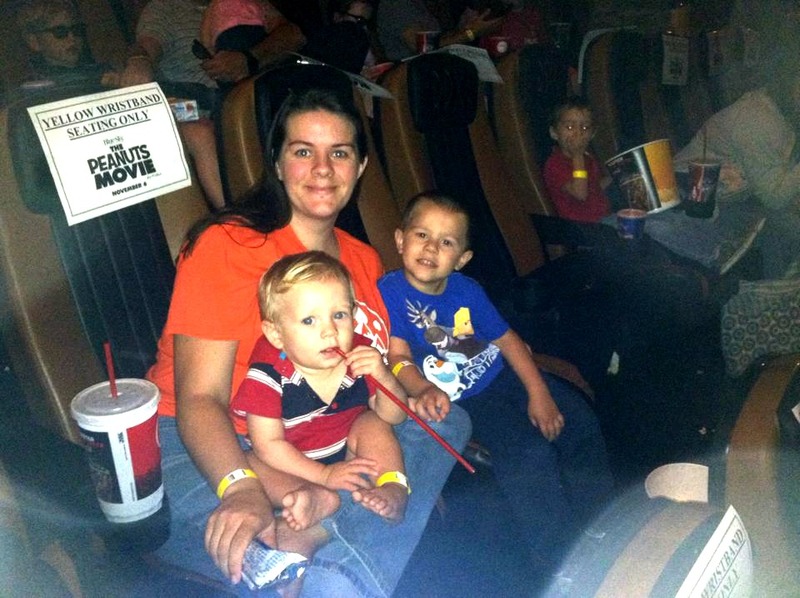 It's definitely a great movie to see with your family! 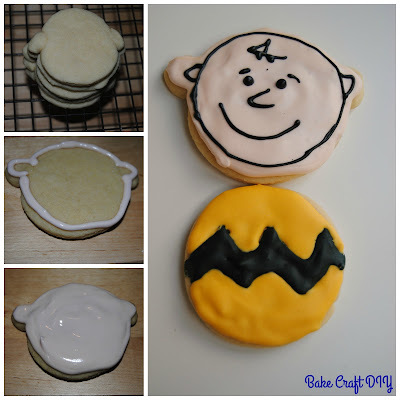 We all loved the movie so much I decided to make some Charlie Brown Cookies using sugar cookie cutout dough and royal icing. 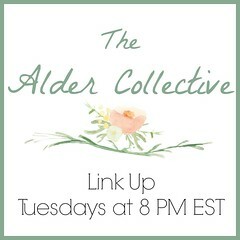 (You can find both the recipes at the bottom of the page.) I really love the dough I make because you can immediately begin to roll out and cut out the shapes you need, in this case, round. I baked the cookies following the recipe (below). Allowed them to cool and then decorated them. 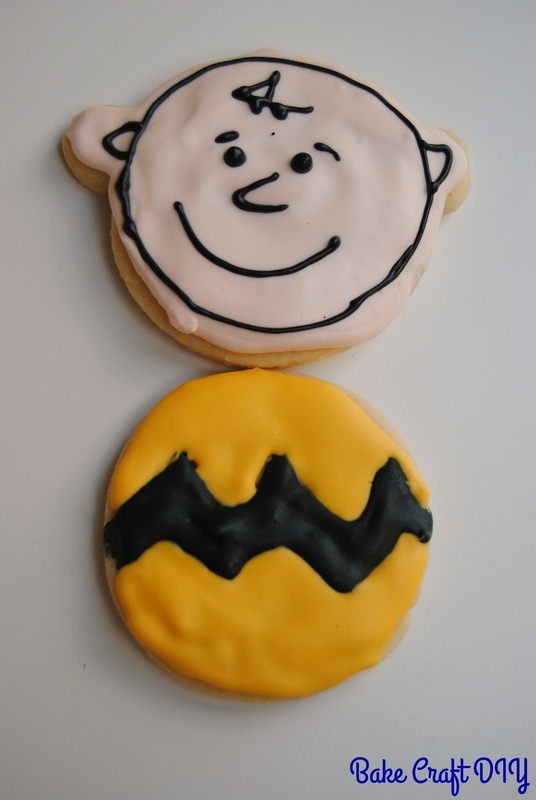 For Charlie Brown's face I made a pink tinged royal icing, I made the outline of his face and then flooded the cookie with the same icing. When the icing dried I came back in and outlined his face and gave him a eyes, a nose, and mouth as well as his signature squiggly hair. 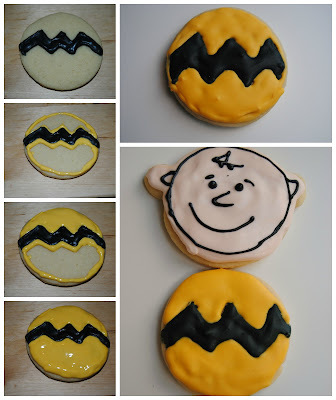 For Charlie Brown's shirt I started by outlining and flooding his black chevron stripe, then I outlined and filled in they yellow/orange for the rest of his shirt. I really love the way they turned out, it was my first time decorating cookies with royal frosting and I am definitely happy with them! Preheat the oven to 375°. Cream together the butter and sugar, add the egg. In a separate bowl mix together the 2 3/4 Cups flour and the baking powder, slowly add the flour into the bowl with the wet ingredients until fully combined. Once fully combined the dough should be fairly soft, use the extra flour as needed to toughen the dough and keep it from sticking to your cutting surface. Roll out your dough and cut out your shapes. 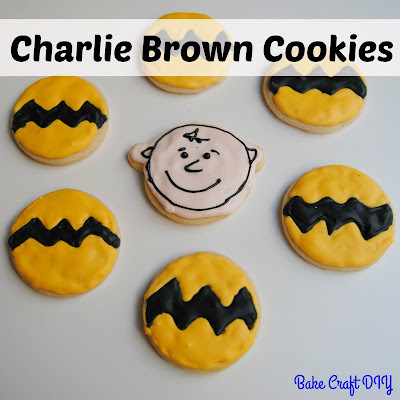 Place them on a prepared cookie sheet and bake for 6-8 minutes or until golden brown. 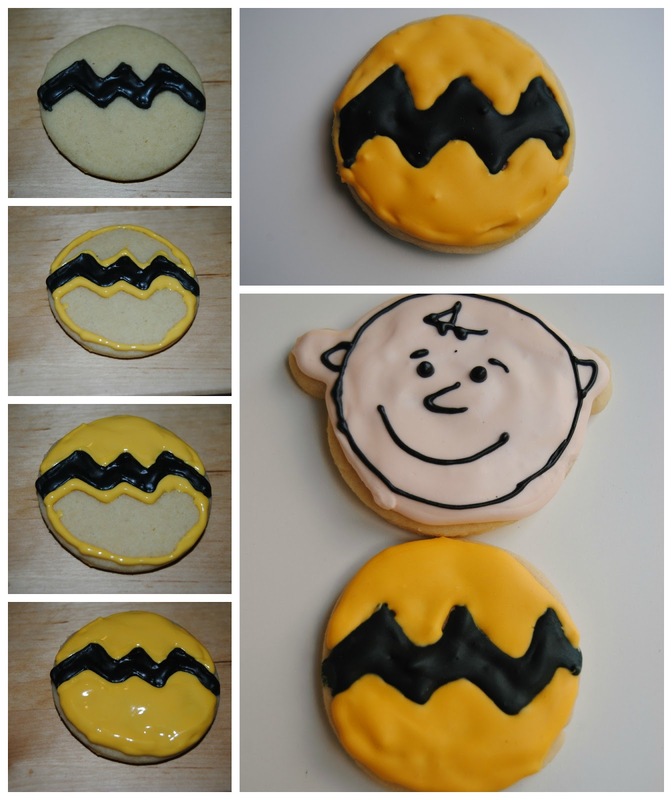 For Charlie Brown's ears I added two small dough balls to the sides of each cookie. I used my Kitchen Aid, you can use a hand held beater or even beat it yourself if your up for the work out. Beat the egg whites and vanilla until frothy, add in the powdered sugar in small amounts and mix on low-medium speed until all the powdered sugar is incorporated and the icing is shiny. You want a thicker icing for the border and a slightly thinner icing to flood the inside of the cookie, you can add water to thin the icing in small increments until it's the desired consistency. those turned out awesome! Can't wait to see the movie! Thanks! The movie is definitely a must see! I can definitely see where you are coming from with the bats! Thanks for stopping by!